In Hinduism, the Rudra Sampradaya is one of four Vaishnava sampradayas, a tradition of disciplic succession in the religion. Vaishnavism is distinguished from other schools of Hinduism by its primary worship of deities Vishnu and/or Krishna and their Avatars as the Supreme forms of God. The ascetic Vishnuswami formed the Rudra-Sampradaya, though the sampradaya is believed to have traced its origins to the Hindu deity Shiva, also known as Rudra, who passed on the knowledge imparted to him by Vishnu (or Krishna), on mankind. According to Vaishnavism, Shiva, who has the Shaivism school dedicated to his worship as the Supreme God, is the first and foremost Vaishnava, or follower of Vishnu. According to the tradition, Vishnuswami was fifteenth in the line of passing of the knowledge from teacher to student. 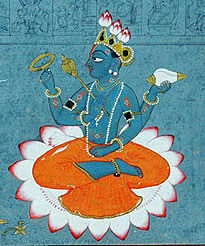 The date of formation of the sampradaya is disputed. While James Hastings dates Vishnuswami to the early 15th century, and Carl Olson dates him to the 13th century, followers of the sampradaya says that Vishnuswami was born 4500 years earlier. Not much about the historical Vishnuswami is known and all his works are thought to have been lost in time. The Sampradaya originated in Sri Kshetra(Odisha) but currently is mainly present in Gujarat/Rajasthan, through the Vallabha sampradaya. The beliefs of the sampradaya was further propagated by Vallabha Acharya (1479–1531). Rudra sampradaya has two main divisions: Vishnuswamis, that is, followers of Vishnuswami and the Vallabhas or Pushtimarg sect, founded by Vallabha. According to William Deadwyler, the sampradaya has disappeared, except for the Pushtimarg group. The philosophy of the sampradaya is Shuddhadvaita, or pure monism. This page was last edited on 23 February 2018, at 05:24 (UTC).